Protesters organize occupation outside the Philadelphia headquarters of Immigration & Customs Enforcement at 8th and Cherry Streets. Twenty-nine people were arrested Tuesday at an occupation protest outside the Philadelphia offices of Immigrations & Customs Enforcement (ICE), where authorities worked to clear the encampment of activists opposed to the federal agency's aggressive policies. Socialist groups blockaded the department headquarters at 8th and Cherry streets for 18 hours before police arrived to break up the occupation, which had cut off vehicular access to the building. 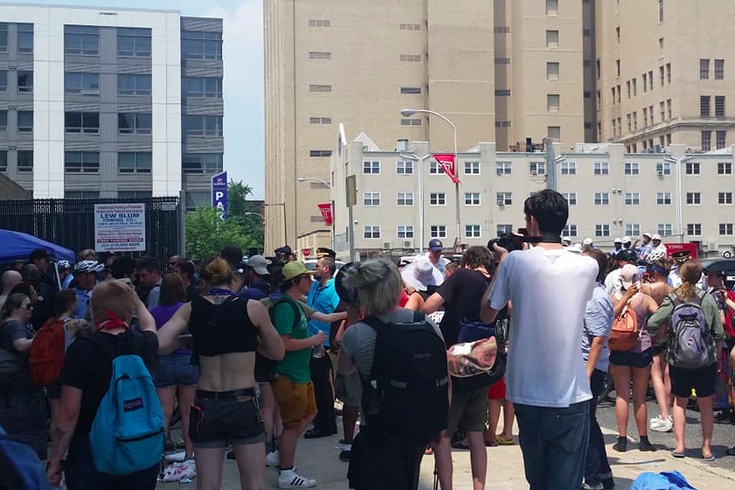 “ICE’s continued existence is politically nonviable," said Anlin Wang, a member of Philly Democratic Socialists of America and Reclaim Philadelphia. "We’re occupying this space in support of undocumented immigrants and their families. We demand not only the end of family separation, but an end to deportation, detention, and the institution of ICE itself." Philadelphia police said approximately 75 people participated in the protest. Those who were arrested have been issued "failure to disperse" citations and released without charges. Two people sustained minor scrapes and bruises, according to police. The occupation was one of several in U.S. cities in recent days, including protests at ICE offices in Portland, New York, Detroit and San Francisco. Wang said the Philadelphia activists plan to maintain their encampment "indefinitely" until their demands are met. The coalition behind the protest has called for the outright abolition of ICE, whose broad mandate extends beyond the current immigration clash into Homeland Security Investigations of human rights violations and other matters of national security. In a year of pivotal mid-term elections, there are questions about whether a slogan will serve as rhetorical fodder for incumbents to simplify political resistance to immigration raids and family separation, stoking fears of a radical "open border" threat. Formed at the same time as the Department of Homeland Security in 2003, ICE encompasses more than 20,000 employees. Advocates for reform, including 19 ICE agents who recently sent a letter to Homeland Security Secretary Kirstjen Nielsen, believe the agency is in need of a reorganization or split with a new unit devoted to immigration. At the state level, the protesters have called for Pennsylvania Gov. Tom Wolf to shut down the Berks Detention Center near Reading, where immigrants are routinely held as their cases move through the legal system. Locally, protesters are calling on Philadelphia Mayor Jim Kenney, who has been an outspoken advocate for immigrant rights, to end the city's Preliminary Arraignment Reporting System (PARS) data sharing contract with ICE. The current agreement requires Philadelphia to provide real-time arrest information to federal immigration authorities. District Attorney Larry Krasner has said he will not approve the contract's renewal, but Kenney also holds decisive input on the decision, the organizers said. In response to the specific demand, Kenney spokesman Mike Dunn said the mayor is considering its options in the context of recent legal rulings on the city's current status. Philadelphia's policy on undocumented immigrants only requires local officials to turn in those individuals to federal authorities if they present a criminal warrant or an order from a judge, not if ICE presents an administrative warrant. Last month, after almost a year of litigation, a U.S. district judge ruled in favor of Philadelphia in its "sanctuary city" case against the White House. The judge determined the federal government could not withhold $1.5 million in law enforcement grant money from the city as a result of its sanctuary status, which is shared by nearly 500 jurisdictions in the United States.